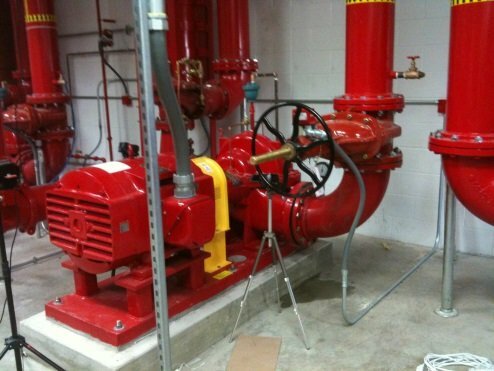 Fire Pumps: Installation & Retrofitting Services | Morristown Automatic Sprinkler Co. Does your building need a new or updated fire pump? If so, Morristown Sprinkler can help! Morristown Sprinkler has performed new fire pump installations for businesses in and around Knoxville, TN since 1975. As well, we have performed countless retrofit installations, and also offer inspection and testing of fire pumps. Why are fire pumps needed? Fire pumps are required when the local municipal water system cannot provide adequate pressure to meet the hydraulic demands of the fire sprinkler system. This typically occurs if the building is tall, such as in high-rise buildings, or in systems that need to flow a large volume of water, such as in storage warehouses. Fire pumps are also needed if the sprinkler system water supply is provided from a water storage tank. How do fire pumps work? Fire pumps are powered by an electric motor or diesel engine. If the local building code requires power independent of the local electric power grid, a pump using an electric motor may utilize what’s called a transfer switch that directs power over to an emergency generator in the event of a power failure. The fire pump starts when the pressure in the fire sprinkler system drops below a threshold. The sprinkler system pressure drops significantly when one or more fire sprinklers are activated or alternatively when other firefighting connections are opened, causing a pressure drop. Types of pumps used for fire service include: horizontal split case, vertical split case, vertical inline, vertical turbine, and end suction. A jockey pump is a small pump connected to a fire sprinkler system in parallel with the fire pump. It maintains pressure in a fire protection piping system to an artificially high level so that the operation of a single fire sprinkler will cause an appreciable pressure drop which will be easily sensed by the fire pump automatic controller, causing the fire pump to start. The jockey pump is essentially a portion of the fire pump’s control system. Fire pump installations and retrofits are governed by the National Fire Protection Association’s (NFPA) NFPA 20 Standard for the Installation of Stationary Fire Pumps for Fire Protection. How do I get more information on fire pumps? To learn more about our services, or to schedule an appointment for fire pump testing, please call us at (865) 689-4480 or contact us right away.